This was a fun way to mix up our same boring dinner routine! The baked potatoes did take forever to cook but in the end it was well worth it! Tuesday: take your lunch to work! I have a new found love- Lean Cuisine Salad Additions. They have a ton of different varieties and it makes packing a salad fun and super easy! In the past I would pack the same salad for weeks and it would become so boring- not anymore!! These Salad Additions are found in the frozen section. I have tried most of them and I really like them! One hint: store in the fridge the night before you plan to eat them- it will allow the salad dressing to thaw so it can be ready to use by lunch time. Also you will need a microwave to warm up the chicken and other toppings including in the bag. 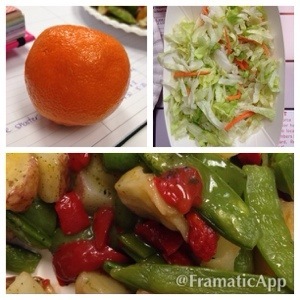 Today’s lunch also features my little halo oranges! Love those little guys- plus they are super easy to peel! We also celebrated Valentines Day on Wednesday and went to an awesome Italian Restaurant with some of our friends. It was delicious as always! 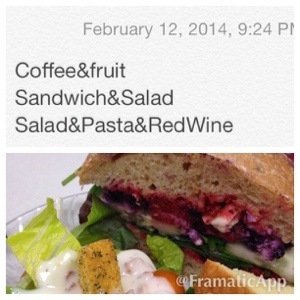 They had a small plate option- I took advantage of the smaller portion and saved half for lunch on Thursday! I try to always make it a point to not completely finish my meal when eating out. Let’s get real portions are downright huge and there is no need to eat that much in one sitting! I am not a breakfast person. I do however love having a smoothie for breakfast-so this was a great challenge for me! I really love the Shakeology Chocolate & Vanilla flavors. They really taste great and keep me full all morning long. 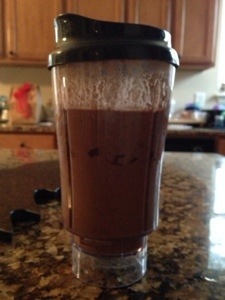 For today’s challenge, I made a chocolate & pb smoothie! Blend it all up and enjoy!!!! 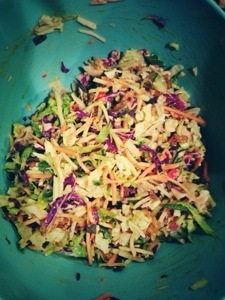 To honor go raw Friday I packed a nice mixed green salad! With the addition of a dressing it was the perfect light lunch to fill me up, but not make me feel stuffed! Week 2 of the challenge has been great. If you ever get into a funk, feel tired or just feel like your eating is out of control- just aim to eat more fruits and vegetables- I promise it will make you feel better. I participated in a clean eating challenge for 2 weeks last year and it was amazing how much better I felt- just from making clean eating choices! Clean eating is not expensive or hard –it is planning ahead! 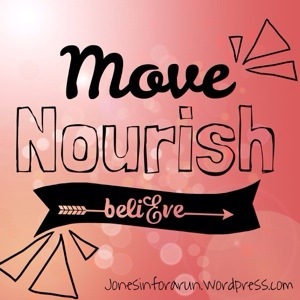 How did your week of “Nourish” go? Any special Valentine’s Day plans? Have you ever tried to eat clean for weeks at a time? How did it go for you?